Soon after launching the National Forum on Youth Violence Prevention, the federal partners involved in the Forum asked the Research and Evaluation Center at John Jay College of Criminal Justice to conduct an assessment of the effort. Working in collaboration with researchers at Temple University, the research team at John Jay designed an “implementation assessment” of the National Forum that is designed to track whether and how each Forum community improves the coordination and impact of its violence prevention strategies and whether those strategies change over time as intended. The John Jay and Temple University research team is tracking the perceptions and opinions of stakeholders in each community about the key outcomes targeted by the National Forum. Using an internet-based survey, researchers are measuring changes in the processes, policies, leadership dynamics, and even personal and organizational relationships that are hypothesized in the National Forum logic model to produce positive effects. This interim report presents results from the first two administrations of the stakeholder surveys. Each survey measured the views and experiences of 20 to 40 informants per community. The research team asked the project coordinators in the Forum cities to identify a group of respondents with the most knowledge and informed opinions about the quality of youth services and violence prevention in their community. This approach was selected largely for practical reasons. The assessment summarizes the development of prevention efforts in six unique communities using six different strategies and in a relatively short period of time. Measuring the effect of these changes with crime statistics or administrative data from city agencies would be impossible given the time constraints and resources devoted to the assessment. Collecting survey responses from targeted groups of qualified, local informants is a cost-effective alternative for tracking implementation. The same approach has been used successfully in other studies of system change initiatives. Surveys were administered twice to respondents in the six National Forum cities. The first administration (sometimes referred to here as Time 1 or simply T1), was launched in June 2011. The second survey (Time 2 or T2) was initiated in February 2012. Researchers began by emailing survey invitations to every respondent nominated by the project coordinators. A total of 393 invitations were emailed for the T1 survey and 377 invitations were emailed for the T2 survey. The site coordinators approved the lists before each round of the survey and confirmed that the nominated respondents were the most informed people about the status of youth violence prevention in their cities. The research team received survey responses from 245 individuals (62%) at Time 1 and 221 (59%) at Time 2. 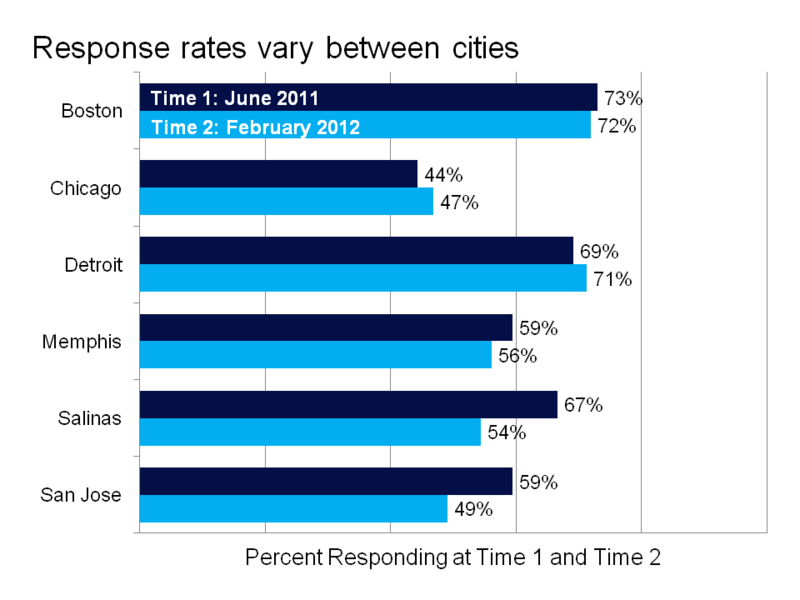 In both administrations of the survey, Boston had the highest response rate (73% for T1 and 72% for T2) while Chicago had the lowest (44% and 47%, respectively). Respondents in each administration of the survey were relatively similar in composition. The majority of respondents were between the ages of 40 and 59 years old (65% T1; 69% T2) and male (53% T1; 54% T2). The racial/ethnic composition of the sample, however, fluctuated somewhat between survey administrations. Almost half (46%) of the respondents at T1 were Caucasian, but just over a third (35%) of T2 respondents were Caucasian. A majority of T2 respondents were either African-American (39%) or Hispanic/ Latino (16%). Only eight months elapsed between the Time 1 and Time 2 surveys. There is no reason to expect large or significant improvements in the perceptions of city residents in that time period. Yet, a number of the questions on the surveys administered by the assessment team showed small improvements. Between Time 1 and Time 2 of the online survey, there was a perceived increase in positive interventions and a decrease in negative activities across the six Forum cities. When respondents were asked to consider the past 12 months, 17 percent reported an increase in available social services for youth and their families at Time 1. The figure increased to 24 percent at Time 2. The positive perception of law enforcement efforts focused on violence prevention also grew between Time 1 and Time 2 (from 48% to 54% reporting increased efforts). These two indicators coincided with a perceived decrease in the visibility of gang activity (45% reported increases in visibility at Time 1, but just 27% at Time 2 saw an increase). Fewer respondents reported an increase in the amount of violence in their cities over the past 12 months at Time 2 compared with Time 1. 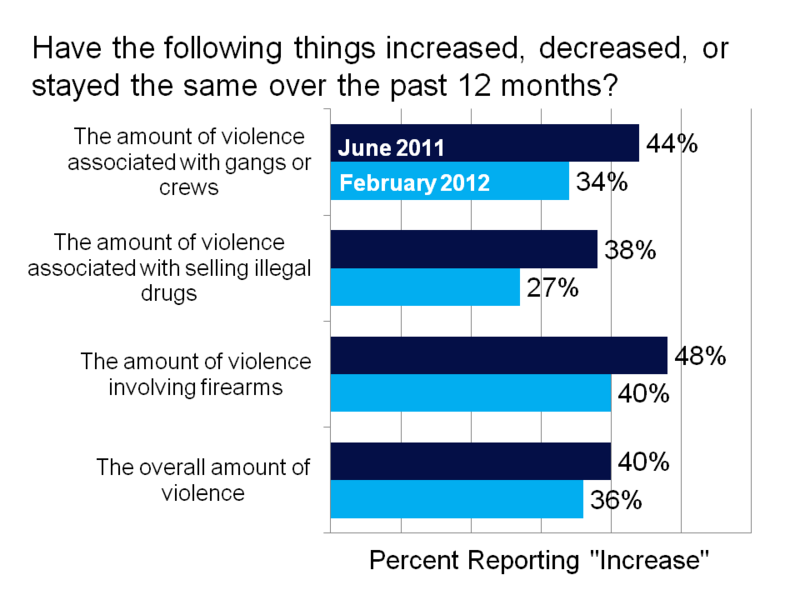 More than one-third of respondents reported an increase in overall violence in February 2012 survey, down slightly from the 40 percent of respondents who reported an increase in violence in the June 2011 survey. When asked about specific types of violence, the largest improvement was for drug-related violence, with 27 percent of respondents reporting an increase at Time 2 versus 38 percent at Time 1. Similar patterns were observed in perceptions of increased gang-related violence (falling from 44% to 34%) and gun violence (down from 48% to 40%). 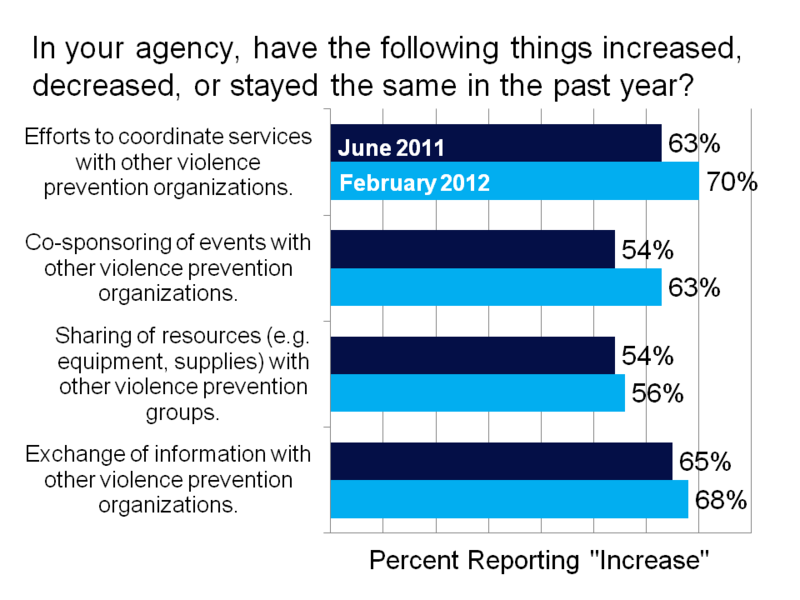 When considering changes in their own agencies over the past 12 months, most respondents reported positive changes that tended towards increased collaboration and coordination of violence prevention efforts. The largest change was a perceived increase in service coordination with other violence prevention agencies — 70 percent of respondents reported a perceived increase in coordination at Time 2, up from 63 percent of respondents at Time 1. There was improvement in the co-sponsoring of events with other violence prevention organizations as well as a small rise in respondents indicating increases in resource sharing with other organizations (to 56% from 54%) and information sharing (to 68% from 65%). The survey results suggest that respondents believe that their communities are cooperating more effectively. More people at Time 2 than at Time 1 agreed that their community teams discussed whether or not they were able to work together effectively (64% to 73%). Respondents generally believe that the collective efforts of stakeholders, public officials, and community groups are having an impact on youth violence. Nearly two-thirds of all respondents at Time 1 felt that public officials in their cities supported the recommendations of community groups and they were confident that the city’s efforts would have an impact on youth violence. These indicators also improved somewhat between the two surveys. Respondents indicated enthusiasm about their city’s ability to achieve its goals. Eighty-eight percent of respondents at Time 1 expressed optimism that their city would be able to make a difference in reducing youth violence. This perception increased to 91 percent at Time 2. Respondents also indicated slightly greater support from the community between the two surveys. 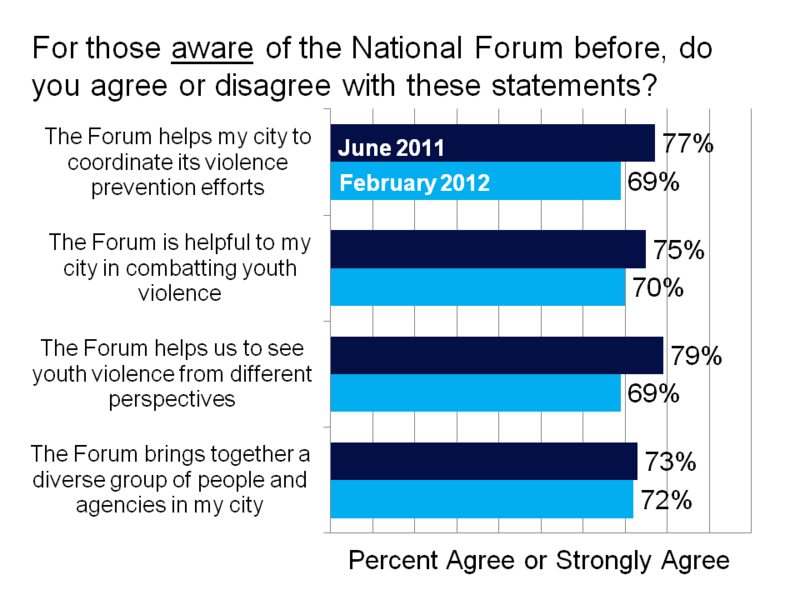 In June 2011 and February 2012, respectively, 74 percent and 77 percent of respondents acknowledged community support for the Forum’s youth violence prevention efforts. Respondent opinions improved on questions about the ability of city organizations to collaborate among one another and with city residents. In 2011, slightly more than 50 percent of respondents agreed that organizations in their city worked together effectively and that their city was effective in involving people from neighborhoods in violence prevention efforts. On both of these issues, there were small improvements between the first and second survey. The survey examined the perceptions of respondents about agencies in their cities and their ability to prevent youth violence and enhance youth education. 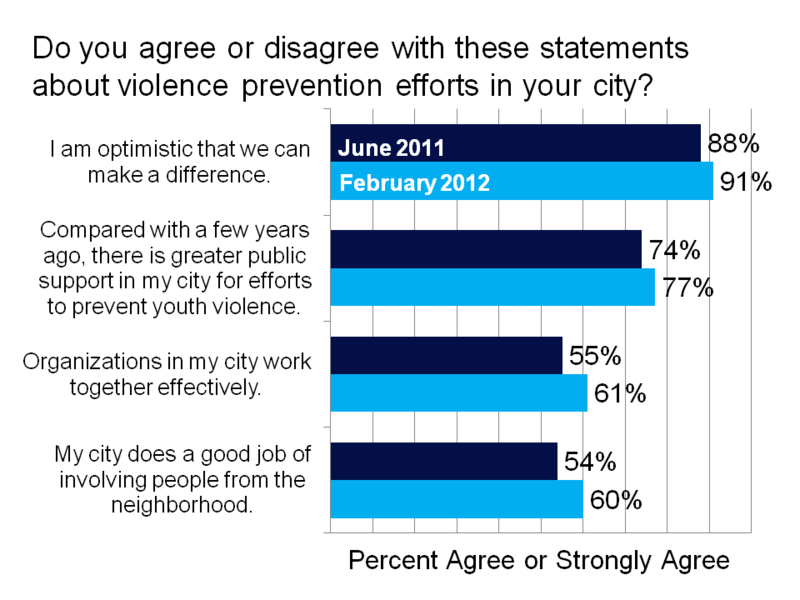 Thirty-seven percent of the respondents in the first survey agreed that their city does well at preventing violence. The percentage increased slightly to 40 percent by the second survey. Respondents also reported slightly greater confidence that youth in their communities could find educational help. Between the first and second survey, the proportion of respondents agreeing with that statement grew from 35 to 39 percent. 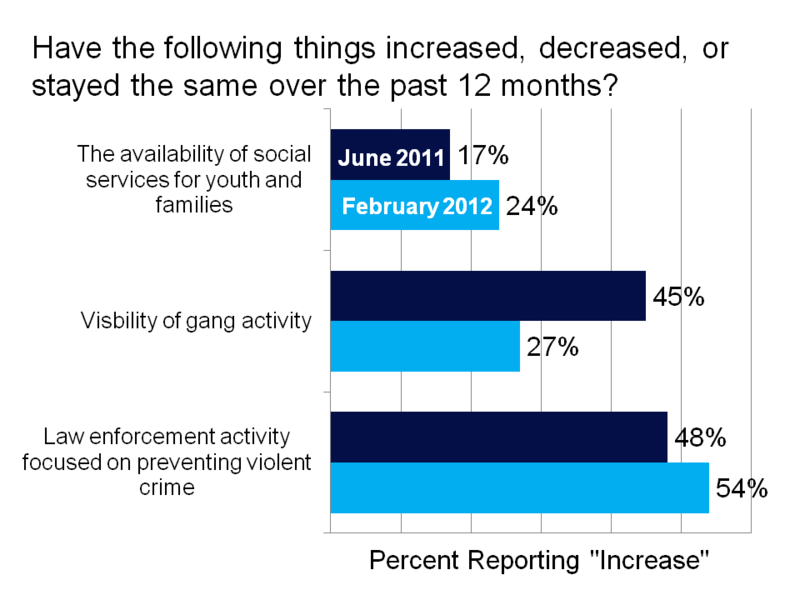 There was also moderately more optimism about the effectiveness of social agencies and law enforcement. The percentage of respondents reporting confidence in social agencies increased from 57 percent to 61 percent, while confidence in law enforcement grew from 69 percent to 74 percent. The results also suggested that survey respondents closest to the National Forum were slightly less satisfied with the Forum than survey respondents had been eight months earlier. The survey asked respondents to assess the impact and effectiveness of the Forum itself. These questions were asked of a subset of respondents — those who were aware of the Forum prior to receiving the survey. Overall satisfaction with the Forum remained strong among these respondents. 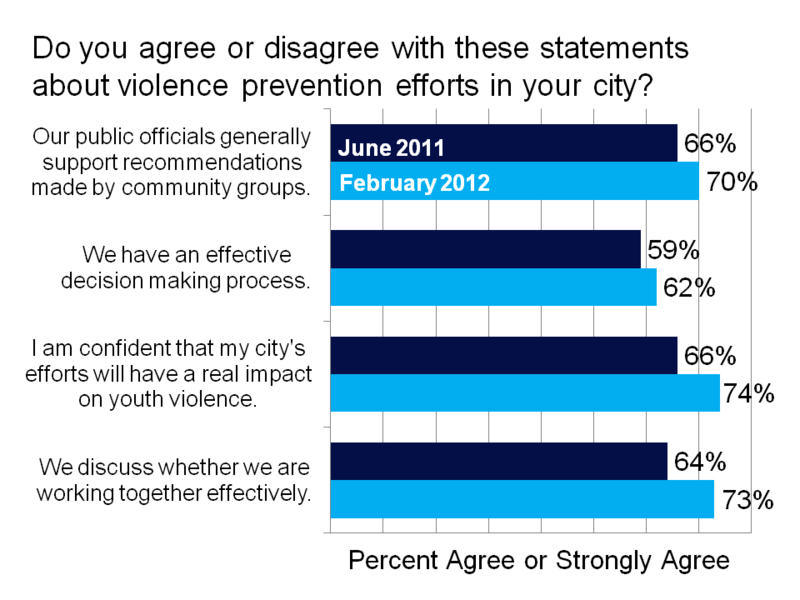 In the February 2012 survey, large majorities of respondents believed that the initiative was helping their city to coordinate violence prevention efforts (69%), combat youth violence (70%), see youth violence from different perspectives (68%), and that it was bringing together diverse groups of individuals and organizations to prevent violence (72%). Between the first and second surveys, however, each of these figures declined somewhat. This could be interpreted either as a decrease in their satisfaction with the National Forum (a negative finding) or as an increase in their expectations of the Forum (a positive finding). When the scale of positive change is examined within individual cities, the survey results can be used to identify the change leaders for each of the items described above. The two cities listed for each item were those with the strongest performance. In other words, between the first and second surveys, respondents in these cities reported the most improvement in relative terms. Each of the six cities participating in the National Forum on Youth Violence Prevention is developing and implementing its own strategies for improving the community’s response to violence. The research team visited each city and interviewed local officials and community partners.